Five events took place around the Rio and three more bracelets were awarded on Day 19 of the 2012 World Series of Poker. The $5K Omaha/8 finished up and Joe Cassidy was crowned the winner after an 11-hour break in the final table action. The $1,500 Shoot Out and the $3K PLO each played down to a winner, as well. We also had Day 2 action in the $1,500 H.O.R.S.E. event and a new event for the WSOP — an action-packed four-handed NLHE variety — got under way. On Wednesday, Event #24 ran for 13 hours, and when there was still no winner as the clock struck 3 a.m. local time, the two remaining players agreed to halt play and pick up on Thursday for the final heads-up match for the bracelet. Joe Cassidy had a 3.5:1 chip advantage over five-time bracelet winner Scotty Nguyen, with around 3 million to the 840,000 of Nguyen. Cassidy had been more than willing to keep going on Wednesday, but when Nguyen asked for the break, he agreed. The good deed was returned at 2 p.m. local time on Thursday when Day 4 was set to begin and Cassidy was nowhere to be found. Rather than taking the much-needed blinds off of the absent Cassidy, Nguyen chilled in the audience until Cassidy arrived some 15 minutes late. Once play got under way, it was nearly all Cassidy. Twice it looked as if Nguyen was going to catch up, but both times Cassidy came back strong. The first time, Cassidy had raised from the button and Nguyen defended his big blind. The flop was . Nguyen checked, Cassidy bet, Nguyen raised and Cassidy called. They both checked after the turn brought the and Nguyen check-called a bet of 120,000 after the fell on the river only to see Cassidy turn over for the wheel. The next time Nguyen pulled to almost even, Cassidy found a hand to move him well back in the lead — for good. From the button, Cassidy raised and Nguyen defended his big blind. The flop came and Cassidy called Nguyen’s check raise. Cassidy called Nguyen’s 160,000 bet on the turn and on the river, it was Nguyen check-calling Cassidy’s bet. Cassidy turned over and scooped the pot. Nguyen survived a half dozen all-ins but was severely short stacked when he put it all-in preflop for his last 200,000. Nguyen had and Cassidy had . The flop came giving Cassidy top pair to Nguyen's bottom pair with the same low draw. However, the turned things around, giving Nguyen a better two pair. But the river was the , giving Cassidy a Broadway straight and the win. 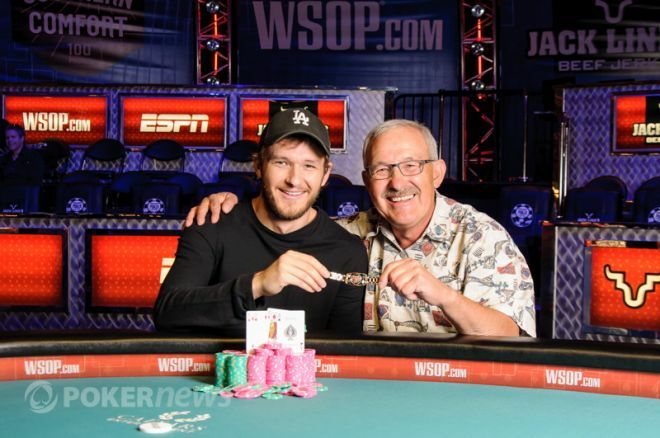 Joe Cassidy becomes the latest poker pro to give up the title “best who’s never won a bracelet.” He has his first gold bracelet after over a dozen WSOP cashes in addition to the top prize money of $294,777. Scotty Nguyen earned $182,213 for second place. To follow all the hands in the final heads up match, check out the PokerNews live reporting blog. The final day of the shootout event had a final table of 10 players, who had each won two previous tables to make it to the end. Just one more table victory would give them the bracelet. Victor Ramdin, Brian Meinders, Sean Rice, Matthew Schreiber, Christopher Vitch, Brock Parker, Preston Derden, Christopher Hartman, Darin Thomas, and Ian Johns each came to the final table with roughly the same chip stack. In the end, Brian Meinders came out on top. It took almost four hours of play for the first elimination of the final table when Hartman was sent to the rail in 10th place. The last hand of Hartman's tournament began when Schreiber opened up the pot with a raise. Hartman then committed the remainder of his chips in the small blind and Ramdin called out of the big blind. Hartman watched on as a flop was dealt. Ramdin check-called a bet and then both players checked the turn. The on the river saw Ramdin check-fold to a bet from Schreiber and Hartman waited for Schreiber to show his hand. When Schreiber turned over his , Hartman tossed his into the muck and headed out of the tournament area. As long as it took to lose the first player from the final table, that’s just how fast the next three were lost. Ian Johns, Sean Rice, Matthew Schreiber were knocked out in quick succession. Preston Derden was out in sixth place at the hands of Meinders. Derden had already committed most of his small stack as the big blind, when Ramdin opened with a raise from under the gun, Parker three bet from under the gun plus one and Meinders four-bet on the button. Derden tossed in the rest of his stack, Ramdin folded and Parker called. Derden was on his feet and watched as the dealer spread out a board. On the flop Parker check-called a bet from Meinders and both players checked the turn. The river saw Parker lead and Meinders raise. Parker called and the three players turned their hands over. Meinders raked in both pots with his aces full and Derden was on his way to collect just over $20,000. Parker was the next to be knocked out by Meinders. In his last hand, Parker open-raised and Christopher Vitch three-bet. Meinders called and Parker four-bet all-in. Both Vitch and Meinders called and they saw the dealer fan out . Vitch checked-raised and Meinders called. Vitch lead out on the turn, Meinders raised and Vitch called. Vitch check-called Meinders' bet on the river. Meinders tabled for nines full of kings and Vitch mucked his hand. Parker flipped up and was the fifth-place finisher. Meinders made it three in a row when he knocked out Victor Ramdin in fourth place. In that hand, Ramdin raised in the cutoff, Meinders three-bet from the big blind, and Ramdin called. The flop came . Meinders bet, Ramdin raised it up, leaving little behind, and Meinders had him commit the rest of his chips. "I need a ten," Ramdin said as he tabled his . He had more outs than that as Meinders turned over just , but the board ran out and Ramdin was not able to get his first WSOP bracelet. Darin Thomas was the third-place finisher to the rail. Christopher Vitch open-raised from the button, Thomas three-bet from the big blind, Vitch four-bet and Thomas five-bet to put Vitch all-in. The cards were turned on their backs. So what monster hands did these two have? The flop gave Thomas the best hand with bottom pair, and when the board ran out , Vitch was the third-place finisher. Going into heads-up play, Meinders had almost a 3:1 chip lead over Thomas — 1,200,000 to 440,000 — and kept up the pressure on his opponent. Thomas eventually got his short stack all-in good holding on a board against the of Meinders. But the turn gave Meinders outs for the straight and one of those, the , came on the river. Thomas took home $71,704 for his second-place finish. Brian Meinders had two previous WSOP cashes — and one previous final table — before this year. He had a second place finish in 2010 and an eighth place finish in 2009, both in NLHE six-handed events. But this time, Meinders made it all the way to the end. He was responsible for six of the nine final-table eliminations. For his first-place finish, he will take home the top prize of $116,118 and his first WSOP gold bracelet. To see all the exciting action as the final ten battled down to a winner, check out our live reporting blog. At the start of day, only 18 players were left to compete for the gold bracelet. Chip leader going into day was Vadzim Kursevich with 741,000 chips. Returning as well were such notables as Oleksii Kovalchuk, Brett Richey, Robert Williamson III, Dutch Boyd, John Racener, and Erik Seidel. But in the end, Austin Scott walked away with his first World Series of Poker gold bracelet and $361,797 in prize money. Erik Seidel entered the day with the second shortest stack and went all-in early with a good starting hand — — against Khiem Nguyen's . Seidel flopped a Broadway straight when the dealer flopped , but Nguyen turned a flush when the fell. The river completed the board with the and that ended the tournament for Seidel — with no ninth bracelet. He took home $13,282 for his 18th-place finish. The official final table was set when short stack Jon Hoellein was eliminated in 10th place. In his final hand, Hoellein three-bet all-in from the small blind for 68,000 and the original raiser, Tom Chambers, called the remaining 32,000. Hoellein tabled and was up against the of Chambers. The flop gave Hoellein a pair and a straight draw, but Chambers held the better kicker. The board ran out and Chambers won the pot with trip sevens with an ace-king kicker. Hoellein was the 10th place finisher, for just over $21,000. The only bracelet winner at the final table was Dutch Boyd, but he was unable to add a third bracelet to his collection. In his last hand, Boyd was first to act in the cutoff seat, raising to 50,000. Scott Stanko reraised the pot to 170,000 from the small blind and Boyd called. The flop was and Stanko moved all-in. Boyd called off his last 120,000 or so and was ahead with for trip tens. Stanko held and needed help, which came in the form of a on the turn. The river was the and Boyd was knocked out in eighth place. Romik Vartzar was knocked out in seventh place by Kursevich and then it took over two and a half hours for the next table elimination. It was Kursevich again delivering the knockout when he took out Tom Chambers in sixth place. Khiem Nguyen was the next player eliminated, this time by Brett Richey — and play was down to four. At the start of four-handed play, Scott took down a monster pot against Kursevich. But the hand started out innocently enough with Scott Stanko, Scott, Kursevich and Richey all limping preflop and then checking after the dealer spread out . But the on the turn started the fireworks. Kursevich and Richey checked, and then Stanko bet 110,000. Scott made it 400,000 to go and Kursevich reraised the pot. Richey folded, as did Stanko, but Scott called all-in for 1.735 million. They turned over their cards and Kursevich showed a flopped set with . But Scott hit a better set on the turn with the by hitting the case ten. After the river brought the , Scott had a massive double-up and was the new chip leader. Scott busted Stanko in fourth place and had over 70 percent of the over 5 million chips in play three-handed. Start-of-the-day chip leader Kursevich could not make it to the end and was eliminated in third place. At the start of heads-up play, Scott had an over 4:1 chip advantage over Richey. Scott immediately started chipping away at Richey, but the latter battled back, narrowing the gap at one point to 2:1. But in the end, it took only an hour for Scott to collect all the chips. In their final hand, Richey made it 100,000 from the button, Scott called and then both checked the flop. After the turn, Scott bet 125,000, Richey raised the pot to 575,000, and Scott moved all-in and Richey called. Richey had for two pair. Scott had straight and flush draws with his . The river hit Scott squarely and the match was over. Richey earned his 13th WSOP cash, his largest to date, of $223,492. But it was Austin Scott, who had an eighth-place finish in this event last year, who took the top prize and his first WSOP bracelet. To see all the bust outs and winning hands of this final day of action, check out our live reporting blog. Day 2 began with the 165 players who had remained from the starting field of 889 runners. Sixty-nine players would go home empty–handed because only the top 96 finishers would cash. Chip leader at the start of the day was Karle “Skip” Wilson, with 74,900. There were still quite a few notables in the field, including Jason Mercier, Alex Bolotin, John Esposito, Max Pescatori, Frank Kassela, Bryan Devonshire, David "Bakes" Baker, David Levi, David Plastick, Kevin MacPhee, Christian Harder, and Mickey Appelman. Unfortunately, none ended their day in the money. The bubble boy was Andrew Prock, who had come in second in Event #20: $5,000 Limit Hold’em. After those remaining in the field had reached the money, there was a flurry of eliminations. Linda Johnson, the “First Lady of Poker,” earned her eighth WSOP cash when she finished in 85th place. She was joined along the rail shortly after the bubble burst by Dan Heimiller, John Monnette, fellow 2011 November Niners Martin Stasko and Eoghan O’Dea, all picking up the minimum payout of $2,676. Start-of-the-day chip leader Wilson exited in 58th place for $3,468. He was joined shortly in the payout line by Steve Landfish, Tristan Wade, and Huck Seed. Chris Bell, Cary Katz, Yuval Bronshtein and Sam Grizzle , among others. David Williams had an up and down day that ended with a 23rd-place finish. Chip leader early in the day, he fell back to a short stack and then moved back into the lead only to again see his stack dwindle. He ended up getting it all-in during a round of razz and was felted by former November Niner Ylon Schwartz whose 8-7 bested Williams when his hand ran out . By the end of the day, 18 players remained. They will return on Friday to play down to a winner. Schwartz is the chip leader going into the final day. Bryce Yockey, Stephen Chidwick, Zimnan Ziyard, David Chiu, Allen Cunningham, Cliff Josephy and Rep Porter will be returning, as well. Make sure you don’t miss any of the final day’s action by checking out the PokerNews live reporting blog throughout the day for constant updates. A new event for the WSOP, this action-packed four-handed variation on no-limit hold'em promised to be fast-paced, and it didn’t disappoint. Action got under way at noon local time and the event attracted 750 players. After 10 levels of play, just 86 were left, six players short of the money bubble. The top 80 finishers would share in the $1,706,250 prize pool, from the minimum payout of $4,385 to the first-place prize of $392,476. This inaugural event brought out many well-known players including Phil Ivey, Jason Mercier, Marvin Rettenmaier, Daniel Negreanu, David Vamplew, Liv Boeree, Aaron Jones, and the 2009 Main Event Champion Joe Cada. None survived the first six levels of play when more than two-thirds of the field were sent to the rail. By the end of the day, Steven Weiss was the chip leader with 171,000 and Brian Rast was close on his heels with 168,000. Also bunched up near the top of the leaderboard are Tony Dunst, Sam Stein and Shankar Pillai. But Lex Veldhuis, Joe Tehan, Matt Vengrin, Jake Cody, Davidi Kitai and Gavin Smith are among the other notables returning to Day 2. Make sure to follow all the exciting Day 2 action by checking out our live reporting blog throughout the day. On Friday, Event #27: $1,500 H.O.R.S.E. , will reconvene at 1300 PDT (2100 BST) and play down to a winner. Event #28: $2,500 No-Limit Hold'em — Four-Handed will also start up at 1300 PDT (2100 BST), playing down 10 levels or to the final table. Two new events will start. At 1000 PDT (1800 BST), Event #29: $1,000 Seniors No-Limit Hold'em Championship, restricted to those players at least 50 years old, and at 1700 PDT (0100 BST on Saturday) Event 30: $1,500 2-7 Draw Lowball. To keep track of how all your favorite players are doing make sure you stayed tuned in to our live reporting blog. Kristy Arnett talks with latest WSOP bracelet winner Joe Cassidy about finally winning his first piece of gold jewelry, playing against Phil Ivey, his tardiness at the start of day four and what's next for him this series.